Since the establishment of Israel in May of 1948, which American political party has shown the most favor to the Jewish state? And, spiritually, what difference does it make? 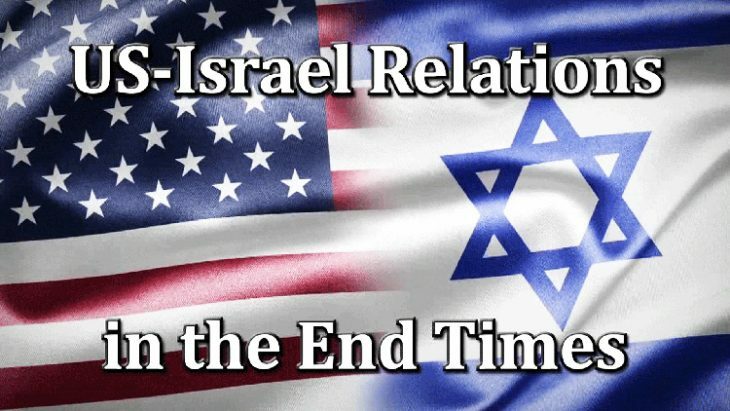 To answer these questions, I produced a 52-minute message entitled “US-Israel Relations in the End Times.” Though this eye-opening sermon is available in its entirety on DVD, I presented an excerpt on our ministry’s television program Christ in Prophecy, duplicated below. Now let us delve into the various U.S. administrations to discern their views and treatment of the nation of Israel. I think by the end of this series you will be surprised. Our relationship with the state of Israel began on the best possible terms in 1948 when Democratic President Harry Truman recognized the State of Israel eleven minutes after David Ben Gurion read the Declaration of Independence. We were the first nation of the world to recognize the existence of Israel. Truman had already shown a great heart for the Jewish people. He favored allowing Jewish refugees into the country after World War II, but the Congress balked at his proposal, so he just sat down and issued an executive order called the Truman Directive. He signed it on December 22, 1945. This order opened the door to Jewish immigration into the United States. 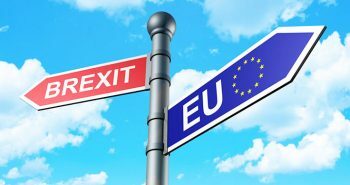 Twenty-three thousand Jewish refugees came in in the next two years coming from Europe. Truman continued to press Congress, and in 1948, he finally got legislation that permitted 80,000 Jews to enter our country in 1948 and 1949. Truman’s swift action on May 14, 1948, made the United States the first nation to recognize Israel. Our recognition gave Israel legitimacy in the eyes of the world. Truman took this action because he was a student of the Bible and he believed the Jewish people had a right to the land. Amazingly, he took this action despite the fact that almost every person in his administration opposed it. In fact, the only person in the Truman Administration who encouraged recognition was the President’s legal counsel. Both James Forrestal, the Secretary of Defense, and George Marshall, the Secretary of State, vehemently opposed recognition of Israel. The only person in the Truman Administration who encouraged the President was Clark Clifford, who was the President’s personal legal advisor. Most of the people in the administration did not like Clifford. They just considered him to be a political operative. But, he was a person who also believed that the Jews had a right to the land based upon his knowledge of the Bible and based upon his feeling that they were entitled to that land as a result of their suffering in the Holocaust. I want to insert something here that I just can’t pass up. I’ve done a lot of study of the life of Harry Truman, concluding that most people don’t know much about him. Let me just tell you a little bit about him. First of all, Truman was a child prodigy. He was reading at the age of three. He had read the entire Bible twice before he entered the first grade. He knew the Jewish history backwards and forwards. It’s amazing how God prepared him. He ended up in Independence, Missouri. There you can count the Jews on one hand within a hundred miles. And yet, when Truman goes into World War I, who’s his best friend? A Jew from Kansas City. They developed a wonderful friendship with each other. Harry Truman’s best friend for life was Eddie Jacobson, a Jew from Kansas City. When the men came back from World War I, they went into business together opening a men’s clothing store. Truman continued that friendship throughout his life. How interesting that when Truman was getting ready to make this decision whether to recognize Israel as a nation or not, everybody in the administration was saying he shouldn’t recognize Israel. Everybody! Their argument was? If you recognize Israel, America will not have access to Arab oil. Sound familiar? Same old argument we’ve heard in the U.S. for the last 70 years. It got down to the bottom line. On May 13, 1948, the day before Israel was about to declare itself a nation, Secretary of State George Marshall called over and said he wanted to come to the White House to make his final argument against recognizing Israel. The President said okay. George Marshall had been the Chairman of the Joint Chiefs of Staff all throughout World War II. President Roosevelt relied on him so much that he would never allow him to enter into the battlefield. Roosevelt ordered Marshall to stay with him in Washington D.C. Marshall would be the strategist, and let Eisenhower fight the battles. For that reason, Truman appointed George Marshall as Secretary of State. Marshall was a man of immense popularity. He was the one who proposed the Marshall Plan. He advised that America must rebuild Europe, because if we didn’t, the Communist would take all of Europe over. Marshall had been selected by Time Magazine in 1949 as the Man of the Year. Truman loved this man. And so, Marshall came to the White House with a large staff of about ten guys that he brought with him. 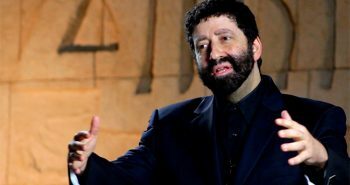 He appointed one of them to speak ordering, “Now, you get up and you give an argument for why we should not recognize Israel as a nation.” This subordinate gets up and for 30 minutes he gives this impassioned argument as to why the U.S. should not recognize Israel. After Marshall’s team’s plea, President Truman turned to Clark Clifford and requested Clifford to give the counter-argument as to why America should recognize Israel as its own nation. Well, Secretary of State Marshall went bananas! He considered Clark Clifford to just be a political operative. Marshall vehemently said to the President like, “I object to this man speaking! I don’t even know why he should be in this room. Why is he even here?” The President calmly replied, “Because I invited him.” And so, at that point, Clark Clifford got up and presented his arguments. All the while Secretary of State Marshall was sitting there steaming. When Clifford finished his counter-argument, the Secretary of State stood up, looked hard at the President, and stated in front of the entire room of people, “Mr. President, if you recognize the State of Israel tomorrow, I will vote for your opponent in the November election.” One person in that room reported it was like all the air was suddenly sucked out of the room. Everybody was astonished. They just sat there stunned. Well, the next morning, Secretary of State Marshall called the President. “Mr. President, I’ve slept on it. I’m still opposed, but if you recognize Israel, I will back you publicly.” And so, eleven minutes after Israel’s Declaration of Independence was signed, Truman recognized Israel as its own sovereign nation. But, that is not the end of the story. 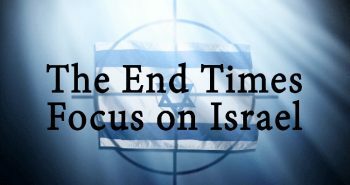 The Bible says God will bless those who bless Israel, and He’ll curse those who curse Israel (Genesis 12:1-3). President Truman was facing the toughest presidential election in U.S. history. When it came to November 1948, the Democratic Party was split three ways. Truman was the nominee for the Democrats. Strom Thurmond had pulled out and formed the Dixiecrat Party, which all the Southern states were supporting. Henry Wallace, the former Vice President, had formed the Progressive Party, which all the Socialists and Communist sympathizers were members. While the Democrats were split into three different parties, the Republicans had the sophisticated, handsome, erudite governor of New York, Tom Dewey, as their candidate. Truman had no hope whatsoever of beating Dewey. None! 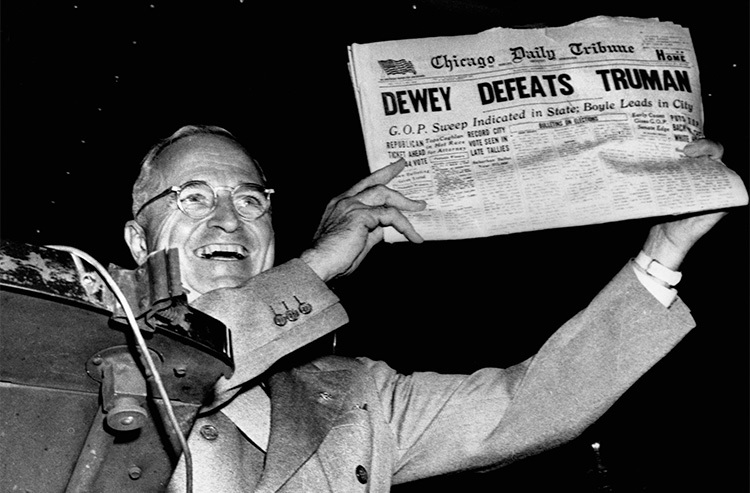 Newspapers across the country had already printed their headlines in advance — “Dewey Defeats Truman.” To this day, no political scientist has ever been able to explain how in the world Truman won that election. But, I know how he did it. God blesses those who bless Israel, and He curses those who curse Israel. Republican President Dwight Eisenhower always supported Israel in words, but behind the scenes he applied great pressure for Israel to withdraw from the Sinai Peninsula after the Suez War in 1956. In fact, Eisenhower became the first president in history to threaten Israel. He told the Israelis that if they did not withdraw from the Suez that he would withhold more than $100 million in U.S. aid. He also supported a UN resolution condemning Israel for not withdrawing. One other thing Eisenhower did was to continue the arms embargo that had been initiated by Truman. Although Truman recognized Israel, Truman did a very naive thing after he recognized them. He announced that he was going to put an arms embargo on Israel so there would be no conflict in the Middle East. America couldn’t ship arms to Israel. They had to buy them from Czechoslovakia and places like that. 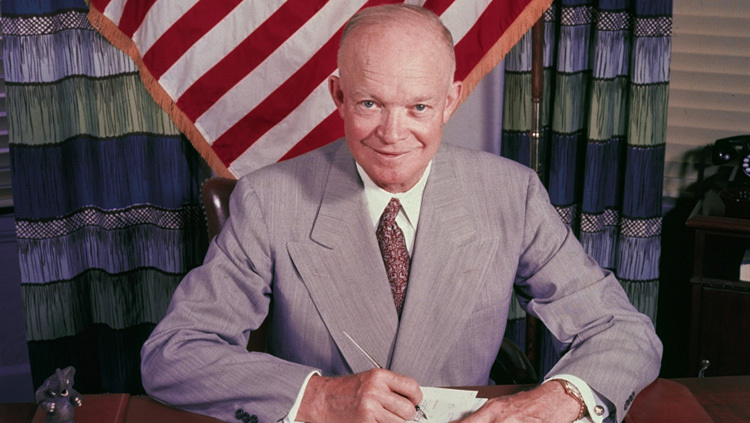 President Eisenhower continued the Middle East arms embargo. In the second segment of our study of how the various U.S. administrations viewed and treated the nation of Israel, we’ll survey the Kennedy through Reagan administrations. Didn’t both Harry Truman and Richard Nixon support Israel and her right to exist. I hope President Trump will be as supportive of Israel, and cut off funding to terrorist groups. Great article; much appreciated. Every supporter of Israel needs to read Millions of Souls: The Phillip Riteman Story; http://www.flankerpress.com. Then you will understand why Newfoundland is the best on place on Earth to live. Mr Truman was my favourite US President by far. A straight talker, a Christian and more besides. David McCullough’s excellent biography is a fine read should you be interested in learning more about this fascinating man. Fantastic! I always so look forward to Dr. Reagan’s tv shows and his posts. There are few men telling the truth in these days of apostasy! Keep feeding us truth! For God to choose someone because of race or nationality is wrong. God chooses those who choose him, hence called the adoption. Jerusalem is a spiritual city. God raises a nation to draw his adopted to. 4 And I will set up shepherds over them which shall feed them: and they shall fear no more, nor be dismayed, neither shall they be lacking, saith the Lord. Jer 23:3-4 (KJV). Exactly the same way he drew his adopted to this nation (U.S.A.) “One nation under God”. But alas the nation always goes the way of the world and becomes a beast. 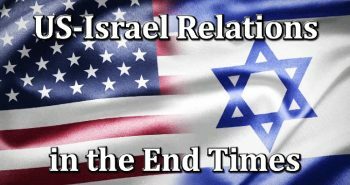 Seven times God has raised a nation of great power, (represented by the sun) Rev 12:1 (KJV), and seven times he has brought it down to the pit (hell), today being the eighth and last time. We (U.S.A.) are the ones who brought down fire from heaven in Aug. of 1945 and we are the ones that gave life to the image of the beast in May of 1948. No people the last and “Great Tribulation” is for all on this earth except the elect. The disobedient and unbelieving unto wrath and vengeance and then the second death, and the obedient and believing (the adoption “the lukewarm”) unto chastisement and then ever lasting life. God most certainly calls people based on race and nationality, and does it often throughout the Bible. Why, that the Messiah came as a Jew shows God chooses by race. And, Jerusalem isn’t a mere spiritual city, but one well explained in Ezekiel 40-48 and Revelation 21-22 as having physical dimensions and components. I dont know from where Mr.Michea got his Bible and interpretations but there are many people today who go to great lengths to prove that the nation of Israel is not the true Israel also they take great pains to prove that God has done away with Israel and has chosen Christians ( the church) simply because the actions of the state of Israel does not suit them as they view it from their own comfort zones instead of seeing it in the real perspectives.Just as I will fight for my existence so is Israel. The new name he is talking about is not christian but Hepzibah and Beulah which are mentioned in earlier chapters. Christian is a nick name given by the gentiles of Antioch , before that they were called ” People of THE WAY” So please for Christ’s sake dont replace Israel is Israel and Church is church, when Messiah comes to rule in Jerusalem we will worship together ( Chruch + Israel) so learn to live and adjust with them now when the chance and time are there. No matter what race you are, God loves you, Do your best to please him in thought, word, and deed. Taste and see that the Lord is good, Psalm 34:8. Whatever you do, work at it with all your heart, as working for the Lord, not for men. Colossians 3:23. Genesis 12:3. I will bless those who bless you, and whoever curses you I will curse and all peoples on the earth will be blessed through you. We should support Israel because God sent us the Messiah through King David, and the Jewish race. Christians are grafted onto the fig tree with the Jews, we are bound together.